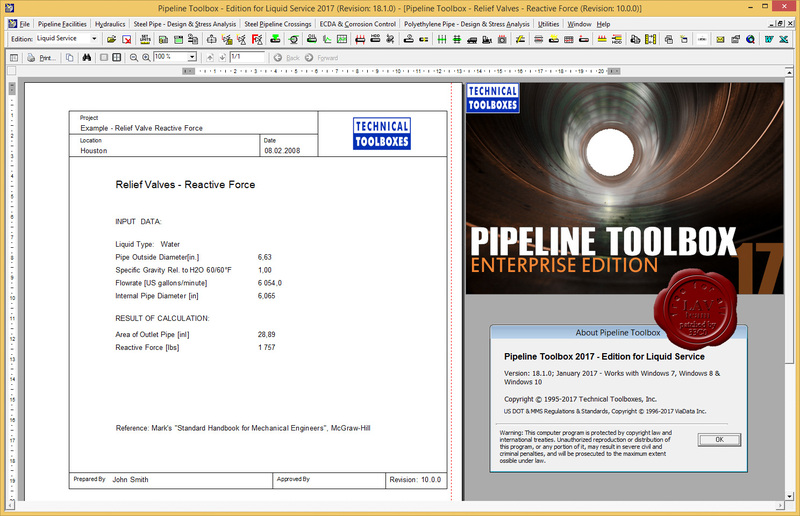 The Pipeline Toolbox is the latest release of the popular integrated software package comes in three separate modules: Gas, Liquid and Enterprise. The Pipeline Toolbox has been designed specifically for gas pipeline professionals, and is based on ASME B31.8 standards. Pipeline Toolbox - Liquid is a NEW release of our popular integrated software package that has been designed specifically for crude and liquid product pipeline professionals. The software is based on ASME B31.4 standards, and contains many of the functional engineering modules and utilities present in previous versions. Pipeline Toolbox - Liquid is designed to increase the productivity and efficiency of the user by providing him with a suite of "tools" to solve day-to-day pipeline design, analysis, maintenance and related engineering problems. Pipeline Toolbox - Liquid consists of 25 separate modules supporting crude and products pipeline engineering, design, analysis and maintenance requirements. Each of these modules contain separate programs, and together provide more than 75 assorted software engineering tools for the pipeline engineer, manager and technician.